* = Various size and color combinations in stock and ready for immediate shipping. Ships in 7-10 business days if non-stock item. Call for size and color availability. 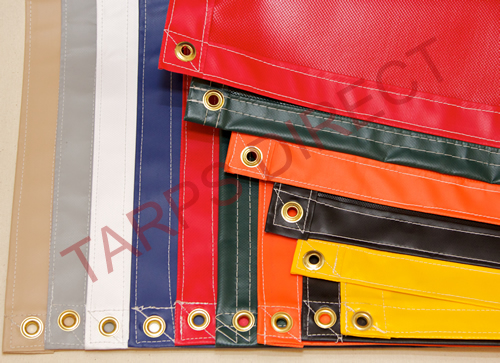 Tarps Direct's 18 ounce Vinyl Coated Polyester (VCP) tarps are 20 mil thick. They are a very strong, waterproof tarp featuring a UV treated fabric commonly used in many industrial applications. Good for dump trucks, trailers, equipment, agriculture or other applications that need a strong cover. Rustproof brass grommets are located in corners and approximately every 24 inches on all four sides. Please call if you require a size that is not listed. Normally ships within 7-10 days. Please note VCP tarps are listed as a cut size – finish size is 3% to 5% smaller. Call for pricing and delivery for custom sizes. Swatch samples available upon request. Rustproof brass grommets approximately every 24"